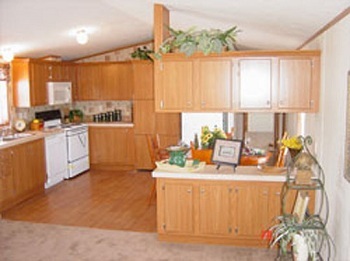 This single wide mobile home floor plan is a 16 X 76 3 bedroom 2 bathroom model with a hidden laundry room and hidden pantry. 1,178 square feet of living space. What looks like cabinet doors opens up into a huge separate room. This kitchen has plenty of cabinets, plus the hidden pantry and laundry room. You can make fewer trips to the store with plenty of room to stock up. Notice the built in Microwave Oven over-top of the stove and the built in dishwasher right beside it. This huge living room is really beautiful and will allow a lot of comfortable family time. This is a view from the kitchen. 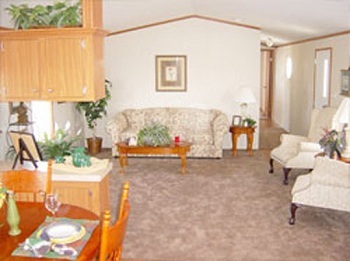 Manufactured homes are designed to squeeze every inch of living space to be maximized for your comfort, and this model sure lives up to that concept. For more outstanding single wide floor plans, check out the links below.